Deceased donor kidneys with AKI are often discarded for fear of poor transplant outcomes. Donor biomarkers that predict post-transplant renal recovery could improve organ selection and reduce discard. We tested whether higher levels of donor urinary YKL-40, a repair phase protein, associate with improved recipient outcomes in a prospective cohort study involving deceased kidney donors from five organ procurement organizations. We measured urinary YKL-40 concentration in 1301 donors (111 had AKI, defined as doubling of serum creatinine) and ascertained outcomes in the corresponding 2435 recipients, 756 of whom experienced delayed graft function (DGF). Donors with AKI had higher urinary YKL-40 concentration (P<0.001) and acute tubular necrosis on procurement biopsies (P=0.05). In fully adjusted analyses, elevated donor urinary YKL-40 concentration associated with reduced risk of DGF in both recipients of AKI donor kidneys (adjusted relative risk, 0.51 [95% confidence interval (95% CI), 0.32 to 0.80] for highest versus lowest YKL-40 tertile) and recipients of non-AKI donor kidneys (adjusted relative risk, 0.79 [95% CI, 0.65 to 0.97]). Furthermore, in the event of DGF, elevated donor urinary YKL-40 concentration associated with higher 6-month eGFR (6.75 [95% CI, 1.49 to 12.02] ml/min per 1.73 m2) and lower risk of graft failure (adjusted hazard ratio, 0.50 [95% CI, 0.27 to 0.94]). These findings suggest that YKL-40 is produced in response to tubular injury and is independently associated with recovery from AKI and DGF. If ultimately validated as a prognostic biomarker, urinary YKL-40 should be considered in determining the suitability of donor kidneys for transplant. YKL-40, known as breast regression protein-39 (BRP-39) in mice, is a glycoprotein involved in inflammation, cytoprotection, and repair.10 It is produced by a variety of cells including neutrophils, monocytes, and macrophages. YKL-40 inhibits oxidant-induced lung injury, limits apoptosis, stimulates reparative (M2) macrophages, and contributes to tissue remodeling and wound healing.10–12 Although YKL-40 was first identified as a mediator of lung repair, it is emerging as a valuable marker of recovery from AKI.13,14 Recently, our group demonstrated that BRP-39/YKL-40 is secreted by renal macrophages and promotes kidney repair after ischemia/reperfusion injury in mouse models.13 In mice subjected to renal ischemia/reperfusion, the absence of BRP-39 did not alter the initial tubular injury but markedly reduced subsequent repair. We showed that BRP-39, signaling through interleukin-13 receptor α2 (IL-13Rα2), plays a fundamental role in limiting tubular cell apoptosis and promoting proliferative repair, thus improving animal survival after kidney injury. These preclinical data suggest that YKL-40 is an important growth and survival factor for renal tubular cells, making it a logical choice as a potential predictor of recovery from AKI episodes before transplantation. This is especially important in the context of deceased-donor kidney selection and organ allocation. We hypothesized that tissue injury leads to YKL-40 production and that increased donor YKL-40 levels would promote cytoprotection and adaptive repair responses that beneficially modulate subsequent kidney allograft function in the recipient. Specifically, YKL-40 expression might facilitate recovery from donor AKI or prepare the kidney to adapt to injury during reperfusion at transplantation. We tested this hypothesis in a multicenter prospective study in which we quantified urinary YKL-40 in a cohort of 1301 deceased donors and tracked the outcomes for the corresponding 2435 kidney transplant recipients. We first determined whether tubular YKL-40 expression corresponded with urinary YKL-40 excretion. We then assessed whether urinary YKL-40 levels were associated with deceased-donor AKI, the development of DGF, 6-month eGFR, and graft failure among the recipients of these kidney transplants. We enrolled 1679 potential deceased kidney donors. Of these, 1301 donors and 2435 recipients were analyzed. A flow diagram of participant enrollment and exclusions is shown in Figure 1. Baseline characteristics of the donors stratified by AKI status are presented in Table 1. A total of 111 (8.5%) donors had AKI. Mean donor age was 41 years and 60% were men. There was considerable variation in organ quality as indicated by the kidney donor profile index, with a mean (SD) of 48 (27). Enrollment of deceased kidney donors and recipients into the study cohort. YKL-40 was found on the surface of tubular epithelial cells, consistent with either uptake of filtered YKL-40 or tubular cell secretion. YKL-40 was barely detectable in a renal biopsy from a donor with urinary YKL-40 concentration of 0.76 ng/ml (Figure 2A). In contrast, in biopsy samples from donors with urinary YKL-40 values of 43 ng/ml and 97 ng/ml, respectively, there was increasingly strong YKL-40 staining in the renal tubule (Figure 2, B and C). YKL-40 expression in deceased donor kidneys. Biopsy samples from deceased donors with measured urinary YKL-40 levels of (A) 0.76 ng/ml, (B) 43 ng/ml, and (C) 97 ng/ml. Urinary YKL-40 concentrations correspond with YKL-40 staining intensity in renal tubular epithelial cells. The three samples were stained with 3,3-diaminobenzidine tetrahydrochloride and counterstained with hematoxylin. Original magnifications are ×400. As shown in Supplemental Table 1, YKL-40 levels were significantly higher among discarded kidneys (P<0.001). The highest YKL-40 tertile was associated with an increased adjusted relative risk (RR) of discard compared with the lowest tertile (1.28 [95% confidence interval (95% CI), 1.05 to 1.55]) (Supplemental Table 2). Because urinary BRP-39/YKL-40 was found to increase in direct correlation with greater injury in our mouse model of ischemia/reperfusion, we determined whether clinically assessed donor renal injury correlated with increases in urinary YKL-40. As shown in Figure 3, YKL-40 levels were significantly higher among donors with AKI (P<0.001). Compared with the lowest YKL-40 tertile, the adjusted RR for AKI with the highest YKL-40 tertile was 6.84 (95% CI, 3.89 to 12.02) (Table 2). Urine YKL-40 had an area under the receiver operating characteristic curve of 0.77 with 70.3% sensitivity and 75.6% specificity at an optimal cutoff value of 3.85 ng/ml (Supplemental Figure 1). Donor YKL-40 concentrations stratified by AKI status. Box plot shows the 25th, 50th, and 75th percentile values for donor urinary YKL-40 by donor AKI status. 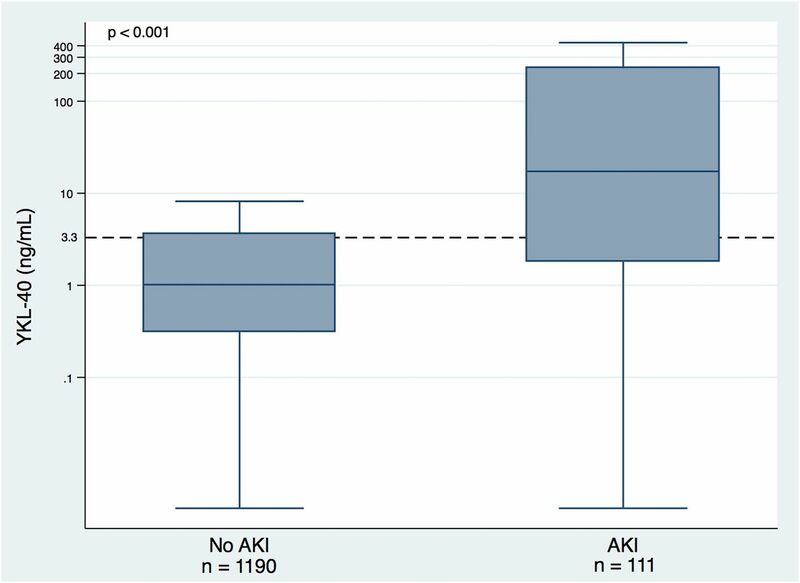 AKI was defined as at least a doubling of serum creatinine from admission to the terminal value. Outliers are not represented on the plots. Outliers were defined as data points below the first quartile by at least 1.5 times the interquartile range or above the third quartile by at least 1.5 times the interquartile range. Y-axis is log transformed. The horizontal dashed line indicates the cut-off for the third tertile of YKL-40. To examine whether urinary YKL-40 levels were independently associated with histologic acute tubular necrosis (ATN), we analyzed YKL-40 relative to procurement biopsy-reported ATN severity. Supplemental Table 3 shows that urinary YKL-40 concentration was significantly associated with ATN severity (P=0.05). However, there was considerable overlap in YKL-40 levels between groups. Table 3 shows recipient characteristics stratified by DGF, which occurred in 756 (31%) individuals. Mean recipient age was 53 years and 61% were men. Our mouse studies demonstrate that Brp-39/YKL-40 functions to suppress tubular cell death and promote kidney repair. We therefore analyzed the association of donor urinary YKL-40 tertiles with recipient kidney function in patients with and without donor AKI (Table 4). We found a significant interaction between the highest urinary YKL-40 tertile and AKI on the development of DGF (Pinteraction=0.05). In recipients of AKI donor kidneys, the highest YKL-40 tertile was associated with a reduced risk of recipient DGF compared with the lowest tertile adjusted for donor and recipient characteristics (RR of 0.66 [95% CI, 0.47 to 0.91]). Because YKL-40 is induced to a greater degree in the setting of more severe kidney injury, we used donor urinary neutrophil gelatinase-associated lipocalin (NGAL, a marker of intrinsic renal damage) to adjust for severity of donor kidney injury. This adjustment unmasked a stronger link between donor urinary YKL-40 and recipient kidney function, with an RR for DGF of only 0.51 (95% CI, 0.32 to 0.80) in recipients of AKI donor kidneys with the highest tertile of urinary YKL-40 versus the lowest tertile. This effect extended to non-AKI donor kidneys in which the fully adjusted RR for recipient DGF was 0.79 (95% CI, 0.65 to 0.97) for highest versus lowest donor YKL-40 tertiles. We also conducted stratified analyses by trends in serial donor serum creatinine by identifying peak creatinine during hospitalization. Among recipients of kidneys with downward trending creatinine, the highest YKL-40 tertile was associated with reduced risk of recipient DGF compared with the lowest tertile in fully adjusted analyses. Among recipients of kidneys with peak creatinine similar to terminal creatinine, the highest YKL-40 tertile showed a nonsignificant trend toward reduced risk of DGF compared with the lowest tertile in fully adjusted analyses (Supplemental Table 4). To determine the relationship between YKL-40 and recovery from ischemia/reperfusion injury, donor YKL-40 tertiles were analyzed with respect to recipient 6-month eGFR (Table 5). There was a significant interaction between the highest urinary YKL-40 tertile and DGF on 6-month eGFR (Pinteraction=0.001). Thus, we conducted stratified analyses by recipient DGF status. In the absence of DGF, the highest tertile of donor YKL-40 was associated with reduced 6-month eGFR compared with the lowest tertile (−5.59 [95% CI, −8.64 to −2.55] ml/min per 1.73m2). However, this association became nonsignificant after multivariate adjustment for donor and recipient characteristics (−1.58 [95% CI, −4.38 to 1.22] ml/min per 1.73m2), and fully attenuated after adjustment for severity of kidney injury using donor NGAL (0.13 [95% CI, −3.29 to 3.54] ml/min per 1.73m2). In contrast, in the setting of DGF, elevated donor YKL-40 was associated with higher 6-month eGFR adjusted for donor and recipient characteristics (5.93 [95% CI, 1.81 to 10.05] ml/min per 1.73m2 for highest versus lowest YKL-40 tertile), and adjustment for donor NGAL further strengthened this association (6.75 [95% CI, 1.49 to 12.02] ml/min per 1.73m2). Sensitivity analyses imputing eGFR to 0 ml/min per 1.73m2 for recipients who experienced graft failure or death before 6 months showed comparable results (Supplemental Tables 5 and 6). The association of donor urinary YKL-40 tertiles with recipient primary nonfunction (PNF) is shown in Supplemental Table 7. PNF was a rare event that occurred in 33 (1%) recipients. The highest YKL-40 tertile was not significantly associated with PNF compared with the lowest tertile (RR of 1.73 [95% CI, 0.71 to 4.23]). The association of donor urinary YKL-40 tertiles with recipient graft failure is shown in Table 6. There were 228 cases of graft failure over a median recipient follow-up time of 2.35 (interquartile range, 1.70–3.09) years. In the absence of DGF, there was no association between donor YKL-40 and graft failure. However, in the setting of DGF, the highest YKL-40 tertile was significantly associated with lower risk of graft failure compared with the lowest tertile in both unadjusted (hazard ratio, 0.61 [95% CI, 0.38 to 0.98]) and fully adjusted (hazard ratio, 0.50 [95% CI, 0.27 to 0.94]) analyses. In this large prospective cohort study, we found that higher donor urinary YKL-40 was significantly associated with improved recipient outcomes, particularly among high risk groups such as recipients of AKI donor kidneys and recipients who develop DGF. We demonstrated that in deceased donors with AKI, elevated YKL-40 levels were protective against the development of DGF. Furthermore, in the event of DGF, elevated donor YKL-40 levels were associated with improved 6-month eGFR and reduced risk of graft failure. Our results suggest that the measurement of urinary YKL-40 at procurement could have prognostic utility in the selection and allocation of deceased-donor kidneys for transplantation. Recently, our group found that BRP-39 exerts a similar protective effect in primary cultures of renal tubular cells. Pretreatment of these cells with recombinant BRP-39 reduced reactive oxygen species–mediated apoptosis by nearly one half. In that study, we also showed that BRP-39 deficient mice displayed impaired recovery after renal ischemia/reperfusion injury, as evidenced by more severe tubular damage and higher serum creatinine on day three after injury as well as increased mortality.13 These preclinical observations suggest that YKL-40 is mechanistically important in renal tissue repair and therefore has the potential to serve as a marker of cytoprotection and recovery in human diseases. In support of this hypothesis, we show that YKL-40 expression is present in human kidneys and that YKL-40 concentrations are raised in the urine of donors with renal injury. These findings, combined with preclinical evidence, suggest that YKL-40 might be upregulated by injured kidneys to limit renal damage and promote adaptive repair mechanisms. Additionally, because YKL-40 is secreted into the tubular lumen and ultimately excreted into the urine, it has the potential to serve as a noninvasive biomarker of tubular injury and repair. On the basis of the biology of AKI and YKL-40/BRP-39 signaling, we believe that elevated YKL-40 correlates with both the severity of initial kidney injury and the ability to repair that injury. Thus, any elevation in donor YKL-40 levels predicts an increased risk of AKI, which independent of YKL-40 portends a higher risk of DGF. However, our data suggest that among those donor kidneys with clinically defined injury before transplantation, the ones with the greatest YKL-40 levels have the best chance of successfully regaining function. This dichotomous role of YKL-40 is consistent with the observation that in recipients who experienced DGF (and must undergo successful repair to re-establish GFR), the highest levels of donor YKL-40 predicted a better 6-month eGFR compared with the lowest YKL-40 levels; whereas among those recipients that did not experience DGF, a high donor YKL-40 level (reflecting some degree of underlying donor kidney injury) corresponded with a slight reduction in 6-month eGFR. In our previous study by Reese et al. we determined the association between donor kidney injury biomarkers and recipient outcomes.3 We found a modest association between donor urinary NGAL and recipient DGF. In addition, in recipients without DGF, donor urinary NGAL and L-FABP were modestly associated with lower 6-month eGFR. All other donor urinary biomarkers measured (KIM-1, IL-18, microalbumin) added no significant value in predicting recipient allograft function. The addition of donor urinary NGAL, the best injury biomarker measured in this cohort, to our clinical model strengthened the association between donor urinary YKL-40 and improved recipient outcomes across all our analyses. These findings suggest that, independent of the effect of tubular injury, YKL-40 promotes adaptive repair in the setting of deceased donor transplantation. Another explanation for these results involves local ischemic preconditioning. According to this hypothesis, ischemic injury in donors during hospitalization may result in the upregulation of anti-ischemic regulatory proteins. In particular, ischemic events before procurement may induce YKL-40 expression, which could protect the allograft from subsequent reperfusion injury. Prior research has suggested that DGF is often a manifestation of severe ischemia/reperfusion injury in transplant recipients. Ischemic preconditioning would therefore explain the observation that kidneys from donors in which AKI is accompanied by a marked increase in urinary YKL-40 are at decreased risk of DGF. Furthermore, ischemic preconditioning may prompt a successful long-term adaptive repair response among kidneys that experience DGF, explaining the progressively better graft function with increasing donor YKL-40 seen in recipients that had DGF. The strengths of this study include the prospective, multicenter design, large sample size, high quality data collection methods, and careful adjustment for multiple donor and recipient characteristics. We acknowledge that there are also some limitations of the study. One limitation is that we only measured YKL-40 at the time of organ procurement, limiting our ability to assess recovery and biomarker trends after transplantation. We adjusted for multiple donor and recipient characteristics, but confounding is still possible given that transplant centers accept or reject organs on the basis of clinical judgment. For example, transplant centers were more likely to biopsy and subsequently discard donor kidneys with AKI. 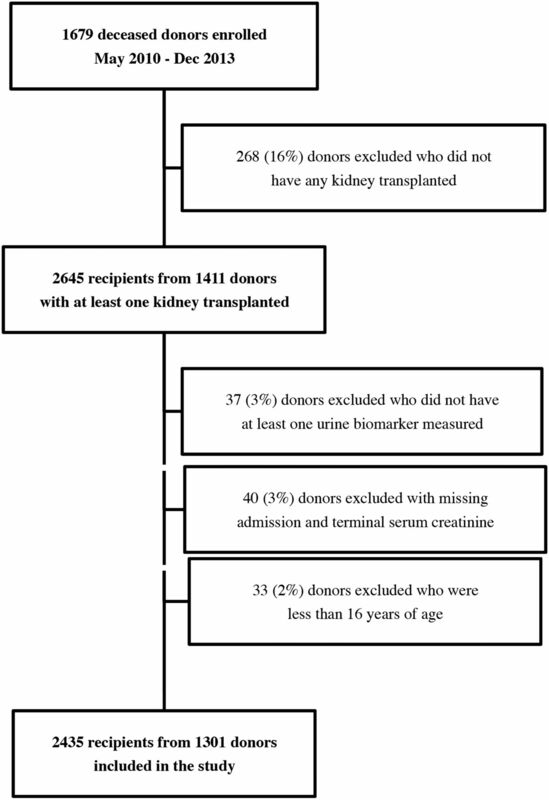 If these discarded kidneys had instead been transplanted, it is possible that those recipients might have had worse graft function than observed in this study. In addition, our analyses were limited to recipient characteristics recorded in the UNOS (United Network for Organ Sharing) database. The UNOS definition of DGF (the need for any dialysis in the week post-transplant) may be confounded by transplant center practice patterns, and the limitations of the UNOS database prevent us from assessing the association of YKL-40 and more robust outcomes such as the need for two or more dialysis sessions. We also acknowledge that, although our results demonstrate statistical and clinical significance, they will need to be validated in other cohorts. The shortage of donor kidneys has led transplant centers to consider organs with AKI for transplantation. However, these organs are often discarded for fear of poor transplantation outcomes. Currently available clinical models to evaluate allograft quality utilize donor clinical attributes, terminal serum creatinine, and occasionally kidney biopsy data, but these measures have limited accuracy in predicting recovery of individual organs.15 Donor biomarkers measured at the time of organ procurement that predict post-transplant renal recovery could help reduce unnecessary organ discard, increase organ availability, and improve recipient outcomes. Our results show that elevated donor urinary YKL-40 was able to predict graft function beyond donor, transport, and recipient characteristics, especially among recipients at high risk for poor outcomes. For potential kidney donors with AKI, it may be possible to reduce discard while maintaining good allograft function by selecting those kidneys with elevated urine YKL-40 for transplantation. Further research still needs to be done before YKL-40 is applied to clinical decision-making. If these clinical studies prove successful, the measurement of urinary YKL-40 at procurement could help evaluate the viability of kidneys for transplantation. Finally, these findings point to YKL-40 signaling as a potential target for the prevention and treatment of ischemia/reperfusion injury. To date, no treatments have been shown successfully to be effective in preventing or alleviating ischemia/reperfusion injury, an inevitable part of organ transplantation. These results should inform the development of novel renoprotective therapies, and future research should focus on extending these findings to other disease settings. We conducted a prospective cohort study involving deceased kidney donors from five organ procurement organizations (OPOs) in the United States. Between May of 2010 and December of 2013, donors whose surrogates provided consent were enrolled in the study. Participants who did not have at least one biomarker measurement, were missing admission or terminal serum creatinine values, and/or were <16 years of age were excluded. Donor characteristics were obtained from the OPO donor charts, and recipient characteristics were obtained from the UNOS database through August 2015. The scientific review committees of the participating OPOs and the institutional review boards of the participating investigators approved the research protocol. We stained for YKL-40 in tissue specimens from three randomly selected deceased donors with available procurement kidney biopsy slides – one each with low, medium, and high urine YKL-40 levels. To assess YKL-40 expression, the tissue sections were deparaffinized and rehydrated in distilled water. After antigen retrieval, the sections were blocked with 1% H2O2 in phosphate-buffered saline at room temperature for 1 hour. Then, the samples were incubated in YKL-40 primary antibody (murine anti-human YKL-40 monoclonal antibody generated by immunization of an epitope of YKL-40 [RGATVHRILG]) overnight at 4°C. IgG-horseradish peroxidase conjugate and 3,3-diaminobenzidine tetrahydrochloride were used to visualize antibody binding. The sections were counterstained with hematoxylin. Donor AKI was defined as at least a doubling of serum creatinine from admission to the terminal value, corresponding to AKI Network Stage 2 or higher (urine output was not used for AKI assessment).17 PNF was defined as dialysis dependence from the time of transplant to the last follow-up. DGF was defined in accordance with UNOS (at least one dialysis session within the first week after transplantation). Six-month eGFR was calculated from the serum creatinine recorded for the 6-month UNOS follow-up form using the CKD Epidemiology Collaboration equation.18 We imputed 6-month eGFR as 10 ml/min per 1.73m2 for recipients with graft failure before 6 months (which included those with PNF). For recipients who died before 6 months with a functioning allograft, we carried forward their last reported serum creatinine to calculate eGFR. Sensitivity analyses were carried out by imputing eGFR as 0 ml/min per 1.73m2 for recipients with graft failure or death. This study used data from the Organ Procurement and Transplantation Network (OPTN). The OPTN data system includes data on all donor, wait-listed candidates, and transplant recipients in the United States, submitted by the members of the OPTN, and has been described elsewhere.19 The Health Resources and Services Administration, US Department of Health and Human Services provides oversight to the activities of the OPTN contractor. As per study protocol, 10 ml of urine was collected from donors just before organ procurement. The samples were transported on ice to the OPO and stored at −80°C until monthly batch shipment to Yale University. After one freeze-thaw cycle, urine NGAL was measured using the Architect platform that is clinically approved for use in Europe (Abbott Laboratories, Alameda, CA). Urine YKL-40 was measured using the Meso Scale Discovery platform (Meso Scale diagnostics, Gaithersburg, MD), which employs electrochemiluminescence detection combined with patterned arrays. The coefficient of variation for this assay was <10%. Laboratory personnel performing biomarker measurements were blinded to clinical information about the participants. The sensitivity and specificity of YKL-40 to identify patients with AKI was determined using receiver operating characteristic analysis. We fit multivariable modified Poisson regression models to estimate the RR of AKI.22 We divided our cohort into tertiles using donor urinary YKL-40 values. The RR of AKI was calculated for each tertile, with the lowest tertile serving as the reference group. We also used modified Poisson regression models to determine the association of donor YKL-40 tertiles with recipient PNF. In addition, we used modified Poisson regression models to determine the association of donor YKL-40 tertiles with recipient DGF stratified by donor AKI status. Subsequently, we fit multivariable linear regression models to test for the association between donor YKL-40 tertiles and recipient 6-month eGFR stratified by recipient DGF status. The estimated mean (95% CI) eGFR was reported for the reference tertile (lowest or T1) and the estimated mean difference (95% CI) for the middle (T2) and highest (T3) tertiles. We used Cox proportional hazards regression to examine the association between YKL-40 tertile and graft failure from time of transplant stratified by recipient DGF status. The hazard ratio for graft failure was calculated for each tertile, with the lowest tertile serving as the reference group. We used Schoenfeld residuals to verify the proportional hazards assumption. These models, except for the outcome of PNF, were adjusted for variables previously shown to be associated with recipient graft function.23 No variables were adjusted for in the PNF model; because of the very small number of events, the addition of variables would run the risk of overfitting the model. All other regression models were adjusted for the following donor factors: age (years), height (cm), weight (kg), black race, history of hypertension, history of diabetes, stroke as cause of death, and donation after circulatory death status. Regression models for the recipient outcomes of DGF and eGFR were further adjusted for donor terminal serum creatinine and the following transport and recipient variables: cold ischemia time (hours), age (years), number of human leukocyte antigen mismatches, black race, gender, previous kidney transplant, diabetes as the cause of ESRD, body mass index (kg/m2), duration of dialysis before transplant (months), panel reactive antibody (%), and log base 2–transformed donor urine NGAL. Collinearity among predictor variables was assessed by Pearson correlation and variation inflation factor. The only covariate that was highly correlated (r>0.5) with urinary YKL-40 was urinary NGAL, with a correlation of r=0.65. All variation inflation factors were <10, indicating that there was no significant multicollinearity in the models. In addition, all regression models were clustered at the level of the kidney donor. For analyses of DGF, we fit prespecified stratified models according to donor AKI status and performed tests for effect modification between donor YKL-40 and AKI on DGF. For analyses of eGFR, we fit prespecified stratified models according to recipient DGF status and performed tests for effect modification between donor YKL-40 and DGF on 6-month eGFR. Analyses were conducted using SAS version 9.3 (SAS Institute Inc., Cary, NC), Stata version 13.0 (StataCorp., College Station, TX), and R version 3.1.2 (R Foundation for Statistical Computing, Vienna, Austria). All tests of significance were two-sided with P<0.05 considered significant. We are tremendously grateful for the study participation of partners at the following organ procurement organizations: Gift of Life Philadelphia (S. West, V. Reilly), the New York Organ Donor Network (H. Lerner, A. Guidice, A. Hoffman), the Michigan Organ and Tissue Donation Program (B. Mattice, S. Shay), the New Jersey Sharing Network (W. Reitsma, C. Godfrey, A. Steward, J.P. Benitez), and the New England Organ Bank (C. Curran, B. McKown). This work was supported by (1) the National Institutes of Health grant R01DK-93770, grant K24DK090203, UO1HL-108638, P30 DK 090744; (2) a Roche Organ Transplantation Research Foundation Award to C.R.P. ; (3) a career development award from the American Heart Association to I.E.H. ; and (4) the Health Resources and Services Administration contract 234-2005-37011C. The data reported here have been supplied by the United Network for Organ Sharing as the contractor for the Organ Procurement and Transplantation Network. The interpretation and reporting of these data are the responsibility of the author(s) and in no way should be seen as an official policy of or interpretation by the Organ Procurement and Transplantation Network or the US Government. This article contains supplemental material online at http://jasn.asnjournals.org/lookup/suppl/doi:10.1681/ASN.2016010091/-/DCSupplemental.